The Top Automotive Magazines find out that next to the Max Verstappen saga, it was Andre Lotterer’s shock debut that was creating the most waves in the Spa-Francorchamps paddock. DPA news agency said there were more journalists at the Lotterer media interviews on Thursday than there were to hear reigning quadruple world champion Sebastian Vettel’s thoughts. Officially, the 32-year-old reigning Le Mans winner’s outing for Caterham – as confirmed by manager Werner Heinz – is a ‘one time thing’. According to Germany’s Sport Bild, it is being facilitated by former grand prix driver Bertrand Gachot, whose energy drink company Hype is sponsoring him. ‘Actually Gachot didn’t want Hype in F1, but the idea of having Andre in Belgium was too good,’ Heinz smiled. The big rumour now is that Lotterer, also a star of the premier Japanese open wheeler series Super Formula, could return to the green car at Suzuka. ‘I accepted Caterham’s offer because I have nothing to lose,’ said the Belgian-raised German, who is also under contract to Audi’s works Le Mans squad. He said Audi had no problem with releasing him for a weekend that did not clash with his official duties. 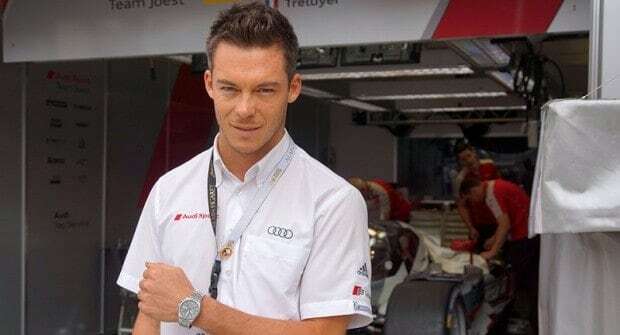 ‘Audi came very quickly and are very happy for me,’ said Lotterer. ‘In Japan they (Team Petronas TOM’s) were not so happy, because I have to miss the race in Motegi in order to be here. I recently had the privilege of spending a week with a little Italian something. When I first heard I would be receiving a Fiat 500 I was overjoyed. The car had been receiving rave reviews in Europe and it was also my very first Italian encounter sans the Uno which is one of those childhood memories I prefer to forget. Great was my shock when a yellow (of all the colours on this good earth) Cabriolet was delivered to my door. This was the 500C and honestly didn’t know how to feel about its arrival. What would people think? What would people say? “He drives a yellow cabriolet”. It’s really something to behold and people did stare, but not long and hard, because this little bugger can move! If I was told a day prior to receiving this car that I would enjoy driving a small, naturally aspirated 1.4 Italian car, I would have laughed, but there I was, behind the wheel of pure, unadulterated fun and I could not stop smiling! The dynamics are absolutely addictive; she pulls out of corners beautifully and clings to the road with all she has. Those 15 inch alloys always staying true to purpose. 74Kw is not a lot, but because she weighs nothing and the suspension is a sorted affair, it feels much faster than it actually is. This is old school, hair in the wind driving pleasure, like nothing I’ve ever encountered before. I’ve driven the Volvo C70 convertible and the BMW 330Ci, and I’m not saying this is better, but this certainly didn’t leave me longing. Interior appointments are top notch and the quality is outstanding for a non-German small car. It has a fabulously flamboyant body colour dash insert made of real metal far as I could figure and the leather and cloth sports seats are body hugging and supportive. The sound system is pleasantly loud and the controls for everything fall easily to hand and are easy to understand also. For such a short wheelbase I can’t understand how Fiat got the suspension feeling so refined. A Mini for instance has a much harsher ride quality on similar sized wheels and tyres. The six speed gearbox is also a very modern contraption, and changed gears with precision. This car loves being hustled and revved and the gearbox wants to be played with. The feature count is also impressive with remote central locking, air conditioning, 15” alloys, dual-control electric power steering, ABS with EBD, 7 airbags, electric windows/mirrors/roof, hill holder, traction and stability control and of course that little black SPORT button that instantly sharpens steering, throttle and lets her rev freely into the red. Big smiles all round. It is such an absolute style statement and some might call it quirky, but even the rich and famous love the attention it provides as Elle Macpherson and Massa are constantly seen driving theirs. I think it has something to do with the fabric roof which nostalgically folds itself onto the back shelf at the touch of a button and just sits there for the world to see. Why hide it? The look is unashamedly retro and after a few days my little back and yellow bumble bee was the love of my life. Yes people still stared and pointed, but they were also smiling. The Fiat 500 Cabriolet. Joy and happiness for just under R200 000 before C02 tax. It s a bargain in my book.